Array. En fait, le livre a 296 pages. The Conceived to Lead: Dismantling the Glass Ceiling Mindset est libéré par la fabrication de CBI Publishing. Vous pouvez consulter en ligne avec Conceived to Lead: Dismantling the Glass Ceiling Mindset étape facile. Toutefois, si vous désirez garder pour ordinateur portable, vous pouvez Conceived to Lead: Dismantling the Glass Ceiling Mindset sauver maintenant. In Conceived to Lead, women accept the challenge to break through the glass ceiling mindset. It was the contentious USA election year of 2016 that prompted compiler Carla Wynn Hall to consider the vital need for women leaders to speak out and join forth in a massive wave of change. 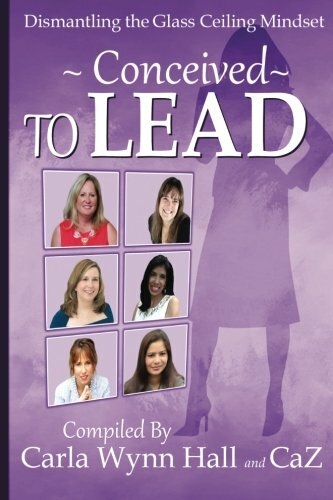 Each of the women authors in this book—successful in her own field—has written a chapter that expresses her leadership philosophy and expands on the role of women as leaders. Sharing her story for some has meant opening healing wounds to expose personal tragedy and triumph. Others expand knowledge and promote understanding of the leadership process as practiced by and relating to women. Still others focus on passing the torch of leadership through tips and experiences. This book is for every person who dares to make an impact; who desires to understand how women leaders cast off the chains of expectation and, on a global scale, lead their followers into a better future. These are the leaders who contributed to this book: Author, editor, and publisher CaZ; Compiler and Author Carla Wynn Hall; Author and Foreword contributor Jessica Peterson; Sponsoring authors Cynthia Beyer, Vicki Ibaugh, and Annette Marie Moore; and chapter authors Rifat Arif (Sister Zeph), Akeh Bernardine, Marie Dahl, Brenda Dempsey, Michelle Den Boer, Lea Durbin, Annette Fluit, Elizabeth Hassan, Claire Heatley, Cheryl Jacobs, Roxanne Lynch, Judith Lynne Miller-McKay, Jennifer Masters, Kavita Melwani, Coni K. Meyers, Rachele Millions, Michelle Molotte, Annette Marie Moore, Dorothy M. Neddermeyer, Joy S. Pederson, Jacqueline D. Pickering, Gloria Grace Rand, Chondra Raye Rankin, Susan Robichaud, Melissa Rodriguez, Laraine Sacco, Trish Springsteen, and Becky Stonebarger.